Do you hope? Our faith teaches us to have hope. Our faith teaches us to have Christian hope – a hope born out of confidence, not desire. Our faith teaches us never to give up hope, because our hope is rooted in the Lord, whose promises will always be fulfilled. But to what end? Perhaps you are indeed clinging on to your hope, placed in the promises of God, rooted in faith and your understanding of the Lord. Perhaps you’re held captive by hope. 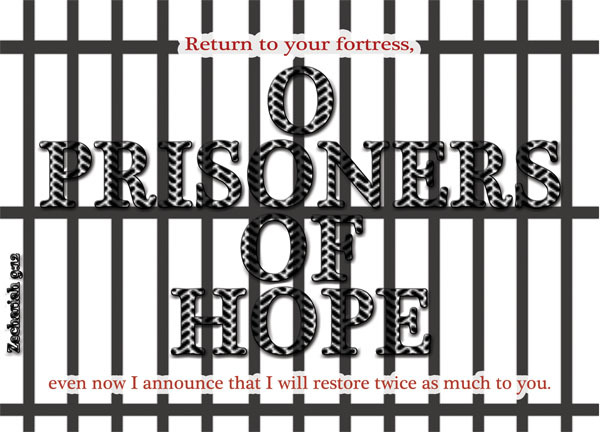 Defining prisoners of hope – there are a few ways to interpret the phrase ‘prisoners of hope’, and while this is not exhaustive, I will briefly touch on two of these concepts. Firstly, a prisoner who has hope. Physically or metaphorically imprisoned, and yet has hope. Locked up in jail for doing God’s work – for eg Paul, and yet still rejoices in faith, for your hope is in the Lord. Facing challenging and horrible circumstances, but still retains hope. Remains positive, placing your hope in the right places. Secondly, taking it metaphorically, in the ‘prisoner of war’ sense, a prisoner of hope. Held captive by hope. Imprisoned because of hope. Typically, someone who has been hopeful for a long time, and yet has not received his or her deliverance. Nothing has changed for the better. There are no signs to indicate that anything is going to change for the better. There is nothing to indicate that your hope will result in anything concrete. And yet you still hope, because you’ve clung on to this hope for so long that if you give up hope at this point, you will have nothing left to sustain yourself. A prisoner of hope – trapped by hope, held captive by hope. Who did the prophet Zechariah refer to when he cried, O prisoners of hope? What kind of people were his targets? I would like to think that they were both of the above listed types of prisoners. They may have been recently freed from the 70 year-long Babylonian captivity, and thus were technically no longer prisoners, they were still, in a sense, imprisoned in their own land with immense hardship and suffering in their lives. It’s like being delivered from on bad situation into another. Yet they never gave up hope, perhaps thanks to the string of prophets that God had sent to them. Honestly speaking, no decent prophet listed in the Bible had a life to be envious of. To give hope to a people who would otherwise be helpless and hopeless? It’s a thankless task. Yet that’s what prophets are somehow very good at. In spite of all their warnings and all their threats and horrifying prophecies, they always managed to link their messages back to restoration, forgiveness, turning back, hope. And it’s precisely because of this continuous line of prophets, who brought hope to the people, that they are also prisoners of hope – held captive by their own hope. They waited and waited in hope for their redemption, in hope for the Messiah, but the Messiah never came in their time. Return to your fortress – or return to your stronghold – which pretty much means return to your God, for the Lord is the stronghold of our lives [Psalm 27:1]. The stronghold, or fortress, or tower of defense – whichever war terminology you prefer – it is in direct contrast to the threat of the enemies and the calamity of the battlefield. Out in the battlefield, there is danger. Back in the stronghold, you are safe. God is our stronghold, in Him we are safe. Here Zechariah tells his people – return to God! Return to where it is safe! At a time when the people may be weary from the burden of the hope that they’ve carried for so long and yet have yet to see, Zechariah redeclares the majesty of the Lord and recalls the people back to God. even now I announce that I will restore twice as much to you – Even at a time like this, when people may be weary from hope, Zechariah makes another declaration, another promise. Restoration will be doubled. Grace is forever in abundance – there are plenty of blessings in Christ, sufficient comfort, enough healing. God is strong, and has the strength to not only provide for our needs, but also provide in abundance. Hence, let us return to the fortress that is God. Let us return back to Him where it is safe, and where his grace is more than enough for us. When we find ourselves weary from hope, and when our hope becomes so heavy that it’s more like a weight and a burden for us to carry, let us remember that God will restore twice as much to us (at the very least I’d like to greedily think); and that our God is our stronghold – he provides and he protects. If our hope suffocates us, it is perhaps time to remember the goodness of our Lord, and remember that the ultimate hope is in him and him alone. Today we may be imprisoned by our circumstances, we may be trapped by our situations. Let us have hope in the Lord. Let us be prisoners with hope. And should the day ever come when we feel that we’ve been held captive by our own hopes, let us look back to God, return to the fortress, and reexamine our hopes.